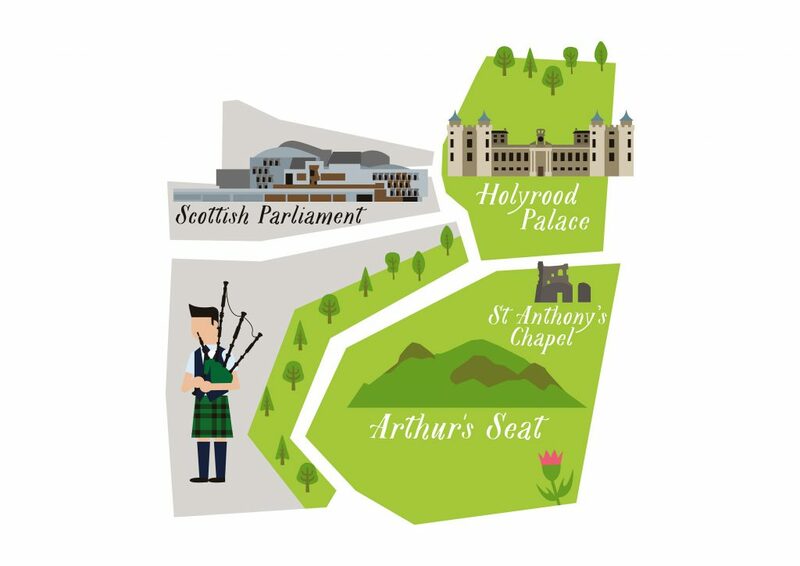 We were asked to design artwork for a modern range of souvenirs that could be sold at the castle gift shops. The range was to appeal to everyone from the UK and overseas, and with that in mind we put together a multi-national team of designers to ensure that the development work would be influenced by Scottish and international perspectives. 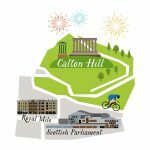 We began a series of preliminary sketches based on capturing the landmarks of Edinburgh in a contemporary illustration style. Because of the variety of applications, the design had to be constructed in a modular way so that we could later deconstruct and pull elements out to use on smaller pieces in the collection – this requirement was to have the biggest influence on our final outcome. The first drafts were based on quite a dense, stacked articulation of the city and its landmarks. As we developed this further however, we found that it wasn’t as flexible as we were first hoping – deconstruction meant losing much of the original artwork’s charm. 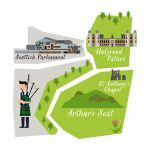 Off the back of these first visuals some custom type had been created for the word Edinburgh, featuring the iconic battlements of Edinburgh Castle. As the project progressed this type style remained popular and ended up becoming a separate design outcome and its own range was created out of it – check out the Edinburgh Battlement range. The type was based on found samples of hand drawn lettering discovered around the city. The resulting type is bold and contemporary but clearly celebrates the past. Moving on from there, our next approach proved to be a more successful modular design. 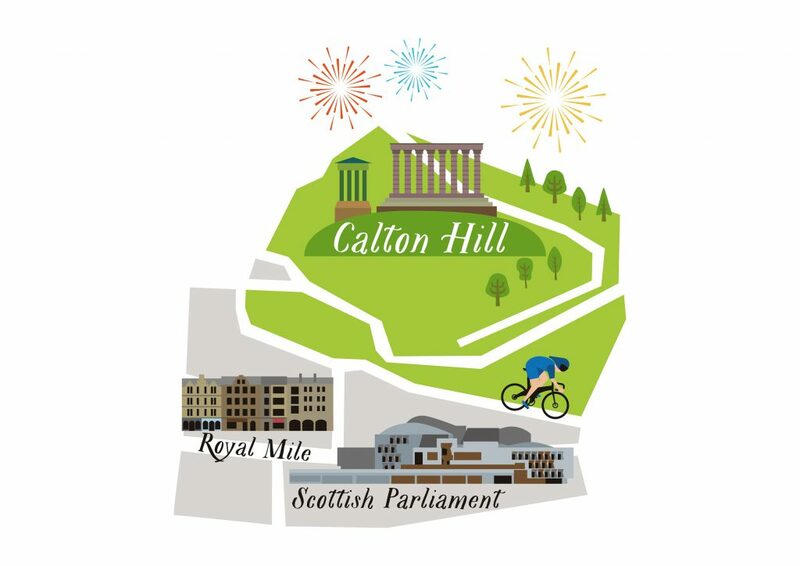 We started sketching out a rough map of Edinburgh, blocking in the various landmarks around the city, and piece by piece the outlines of an illustrated map began to form. The key thing here was that the map would be a very flexible piece of artwork with many landmarks that could be used in isolation or grouped together as smaller sections of the city. A contemporary illustration style was developed that we were sure everyone would love. 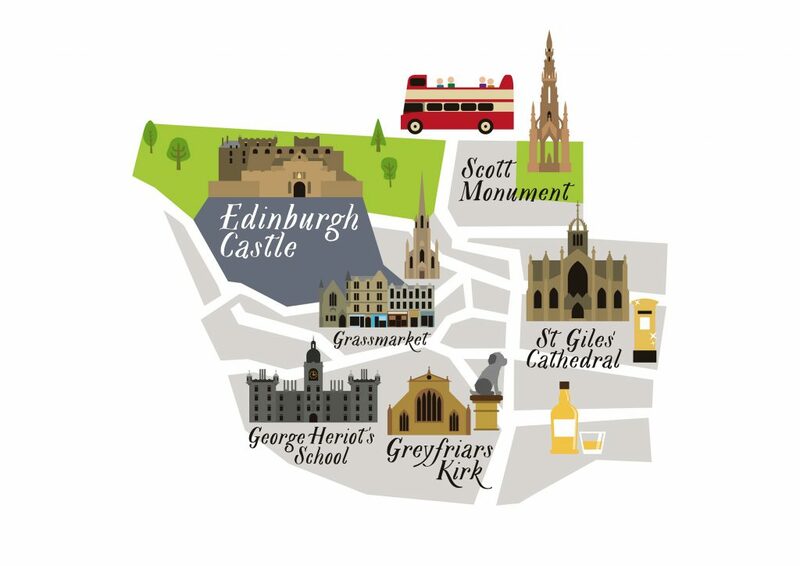 And then work began on depicting the architecture and layout of Edinburgh. Every building and landmark has been meticulously constructed, balancing the look and feel of the overall piece with the potential restrictions of reproduction at small sizes. This was quite a tricky task as much of the historic architecture of Edinburgh is very detailed and ornate, various drafts exploring construction and colour were undertaken. 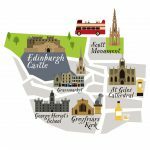 Gradually all of the elements came together to form our illustrated map of Edinburgh. We then took a view on the overall balance of the map and edited the content until a final composition was agreed. 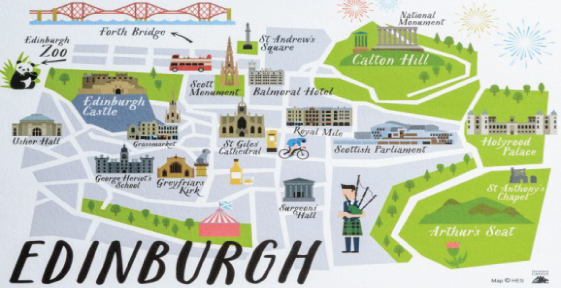 The final illustrated map was combined with some impactful Edinburgh lettering that creates a nice visual counterpoint to the finer detail of the illustration. The elements of the final map where then deconstructed and combined into various additional configurations, extending the flexibility of the artwork. Elements from the design were reconfigured as illustrated skylines. Next time you are up at the castle pop in to one of our gifts shops to see the finished collection or browse through our collection online. We have everything from cotton bags, to travels mug and magnets for your fridge.